The $22 million ecommerce company, which provides hundreds of upscale gourmet gifting options, will turn 15 on November 15th. The selfie search invites everyone to join the countdown to this big birthday by posting selfies with the number 15 in them on the company's Facebook or Instagram pages. 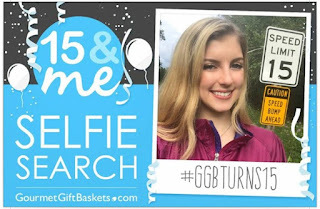 All posts must be family-friendly and should contain the hashtag #GGBTurns15. The "15" can appear on nearly anything -- a cake, sign, house, T-shirt, or even printed on paper. Contestants can post as many different shots as they'd like, as well, since all posts count. All entrants will vie for one of 17 exciting prizes. The contestant with the most creative entry will win first prize – a whopping $1,500 worth of upscale goodies! These could include elaborate gourmet baskets, towers, cookie cakes, and many more WOW-inspiring gifts. The entrant with the highest number of posts will win second prize -- a three-month membership in the Monthly Cheesecake Club, receiving a different cheesecake flavor each month. Finally, 15 third-place winners will be chosen randomly to receive one-gallon tins of handcrafted gourmet popcorn, since GourmetGiftBaskets.com offers nearly 100 popcorn flavors from sweet to savory. 1. 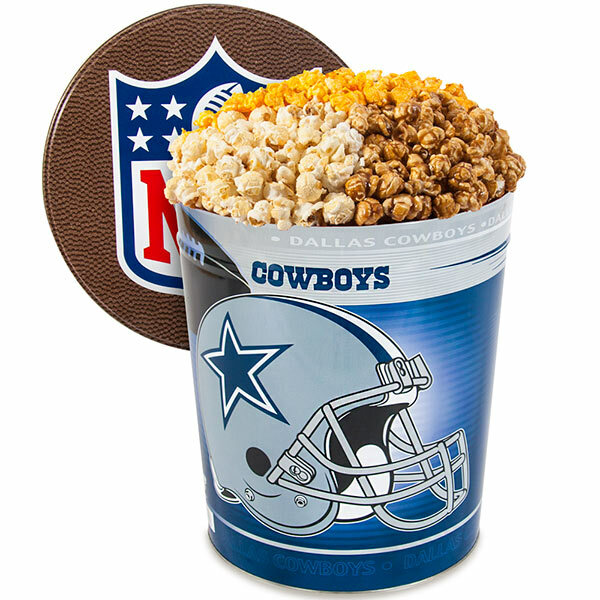 NFL Popcorn Tins -- $59.99: How great are these, especially for couch-bound quarterbacks and other football game lovers? Tailgate in your family room with these attractive, branded tins reflecting the passion behind several top teams. Currently, GourmetGiftBaskets.com has very colorful, three-gallon tins for fans of nine different teams: New England Patriots, Denver Broncos, Dallas Cowboys, Pittsburgh Steelers, Philadelphia Eagles, Seattle Seahawks, New York Giants, Green Bay Packers and the New Orleans Saints. Some of our all-time most popular flavors for men are included in each tin -- Kettle Corn, Cheesy Cheddar and Caramel Popcorn. 2. MLB Popcorn Tins -- $59.99: Now, if the men in your life would prefer playing or watching baseball, we've got you covered there, too. Sports-team ensconced tins are available for fans of the following teams: Boston Red Sox, New York Yankees, New York Mets, Detroit Tigers, Cleveland Indians, Chicago Cubs, LA Dodgers, San Francisco Giants, and the St. Louis Cardinals. Kettle Corn, Cheesy Cheddar and Caramel Popcorn are the featured flavors in these tins, as well. 3. Fall Seasonal Beer Bucket -- $69.99, SKU 4521: Our seasonal beer buckets have been very popular and this one with its autumnal flavors promises to delight microbrew beer lovers as much, if not more, than its predecessors. This bucket includes Oktoberfest by Otter Creek, Pumpkin Head by Shipyard, and Harvest Barn Ale by Long Trail. Snacks that bring out the best flavor notes in these beers include our own handcrafted Hickory Maple Bacon Kettle Corn and Buffalo Popcorn, along with summer sausage, spicy cheddar cheese, crackers, pretzels and nuts. 4. 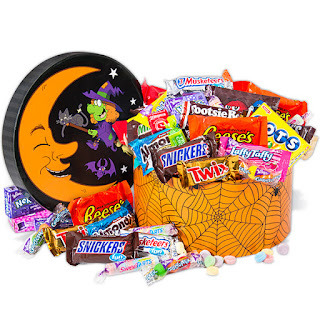 Halloween Candy Stash -- $29.99, SKU 4761: Most guys love candy (and reliving the years of their youth). Well, this new Candy Stash offers enough candy for the guys and the whole family. If you're interested in featuring something else for Halloween, click here to see the full selection.